General Farm Information Basingstoke Farms is premiere combined training/eventing facility located in northern Florida - directly west of Gainesville. The farm's 200 rolling acres includes full cross-country courses from 18" jumps to Tremaine Cooper's Intermediate course, a complete stadium field, 2 sand dressage rings, a 6 stall private barn, a 20 stall show barn and plenty of room to ride throughout woods & open fields. The Novice, Training and Preliminary cross-country courses are designed and built by Martie and Bill Healy. Martie is an USAEq 'r' Eventing Course Designer. These courses are continually upgraded and re-designed. The Intermediate course is designed by Tremaine Cooper and built by Martie and Bill Healy. Tremaine is a FEI 'C' Eventing Course Designer as well as an USAEq 'R' Eventing Course Designer. Horse Trials and Show Information Current information regarding our Horse Trials and Shows can be found here on a timely basis - including entry status and times as they become available. Release Form - MUST be signed to ride on Basingstoke Grounds! Click on the link above to download the prize list/entry form you are interested in. Use the back button on your browser to return to this page. These are rather large files, please be patient for the download. Most files are pdf files - they can be read with Adobe Acrobat Reader. This is a free program, if you do not already have it on your computer, click on this graphic to download it for free. Boarding Information Basingstoke Farms is open for a limited number of boarders - both permanent and temporary. All boarded horses must have a current Coggins and follow the farm's worming program. Full use of the facilities is included with full and temporary board. Daily boarders must pay the regular schooling fees for use of the facilities. Daily boarders at Basingstoke during events and shows must pay the stall fee as published in the prize list. Turn-out is emphasized for the health and well-being of the horses. Basingstoke Farms has very large, well fertilized and over-seeded turn-out pastures which are rotated amongst the boarded horses. Pasture board is not accepted at this time. Permanent board includes stall cleaning and twice daily feeding. Temporary and Daily board is self-care (stall and bedding). Vet and farrier care can be arranged through Basingstoke Farms at an additional fee. Schooling Information Basingstoke Farms is generally open for schooling of its cross-country courses, stadium jumps and dressage rings. Persons wishing to school must call ahead (352-542-2755 or email info@basingstokefarms.com) in order to verify course availability. The farm is closed from time to time due to events, shows, the weather and personal reasons. Please understand that Basingstoke Farms is a private farm, we are not a commercial facility with 'open' hours or days. Schoolers must sign a release and pay all fees before riding and wear an approved helmet with chin strap fastened at all times when mounted. If the schooler is under 18 years of age, the release must be signed by a legal guardian. Releases may be obtained ahead of time by contacting Basingstoke Farms or by clicking HERE. New schooling policies for 2002! We prefer that schoolers do not ride out on the cross-country course alone. Hacking Out is defined as a ride without jumping. 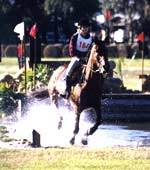 Walking through the water jump or attempting a small jump is considered cross-country schooling. Lodging is available on the farm from time to time in a new mobile home. It sleeps 7 and has full kitchen facilities and 2 full baths. Call or email (352-542-2755 or email info@basingstokefarms.com) for availability. We are pleased to announce that as of July 15, 2003 our new Har-Tru Tennis Court will be available as an added attraction to our schoolers and visitors. Court time rental is $5/hour/person; racquet rental is available at $10/racquet/session. Location Information Basingstoke Farms is located in the "Big Bend" of Florida. We are 1 hour directly west of Gainesville and about 1 hour from the Gulf of Mexico. We are just 2 miles from the Suwannee River. Many natural springs make up the Suwannee River, affording swimming and cave diving year-round. Fanning Springs is just 15 minutes from the farm and is a great place to go for some relaxation and to cool off. The towns of Suwannee, Steinhatchee and Cedar Key are on the Gulf of Mexico and are very easy to get to from Basingstoke Farms. Deep sea fishing, great seafood restaurants and shopping are some of the attractions of these little resort towns. For exact directions on how to get to Basingstoke Farms, please contact us - either by phone (352-542-2755) or email.